May is National Egg Month and the great folks over at KRUPS sent over this delicious looking Egg Bake recipe for me to share with all of my foodie blog readers. I don't know about all of you, but my family loves eggs and we eat them almost daily in one form or another. Eggs supply a wide variety of vitamins and minerals such vitamins A, D and E. In fact, egg yolks are one of the few foods that naturally contains vitamin D. Eggs are also low in calories...they are about 75 calories per large egg. From hard boiled to poached, the incredible, edible egg is a nutritious powerhouse for meal and snack time. 1. In a ungreased 13-in. x 9-in. x 2-in. baking dish, sprinkle half of both cheeses and set aside. 2. In a medium skillet, sauté mushrooms, onions and red pepper and spinach in butter until tender. 3. 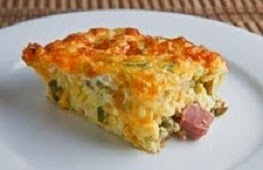 Place over cheese and top with ham or sausage. Sprinkle mixture with the remaining cheese. 4. In a bowl, beat eggs. Add milk, flour, parsley, dill, salt and pepper; mix well. 5. Slowly pour over the cheese. 6. Bake at 350 degrees F for 35-40 minutes or until a knife inserted near the center comes out clean. Disclaimer: The recipe and photo is courtesy of KRUPS. Please see their web site for additional recipes and product information. No compensation has been received. Your blog caught our team's attention and would like to add your blog to the Top Food Blog list in www.mytaste.com/ . Your blog is impressively BEAUTIFUL and it deserves to be included on the Top list!! Great recipes!! We will feature your blog and we will make a lot of shout out about your recipes on our fan pages so that people and our 4million users worldwide will be able to check it on our site.